We will have our last Embroidery Club session this Saturday (Friday not available) at 10:00 a.m. You will be making the Sweetest Equation Tea Towels. You will need a 5 x 7 hoop for this project. If you signed up for the year, you will received all of the patterns for the club. Otherwise, you will get the patterns for the meetings you attended. We will have 2 last make-up sessions on Friday December 7th and Saturday December 8th. 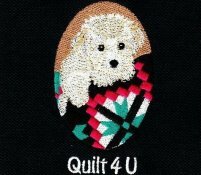 If you are wanting to make up any prior projects, please e-mail me at info@quilt4u.com. We will then notify everyone on which day the make-up session will be scheduled. 1. Please advise if you will be attending on Saturday December 1st. No make-ups this week. 2. Please advise of any make-up classes you want to complete the following week. Thank you for being a part of our first embroidery club. We will be notifying you soon of future embroidery activities. We will furnish towel and fabric for appliques.